I finally got in to see my General Doctor last Monday. He said my thyroid levels were still out of wack and that he thinks my Endo my be over medicating me. That’s why I have extreme fatigue. 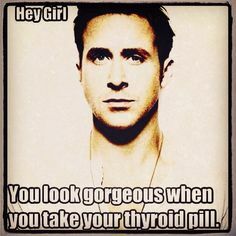 He says it looks like I might have Hypothyroidism now or that I might have Thyroiditis. He said not to quote him on all this though since he’s not an expert. He says I should go back to my Endo. I refuse to go back to my current one though because he didn’t tell me anything, then charges me $45. I have been trying to call the new one to see if I can get in before December. No such luck yet. My General doctor also told me I had Chronic bronchitis. That accounts for my chest pain and a few other symptoms. He put me on antibiotics, an inhaler, and steroids for two weeks. I guess they’re working. It’s hard to tell because I’ve been having bad side affects from them. My doctor also wants me to see a rheumatologist about rheumatoid arthritis. He thinks that might be the cause of my bone pain. Well those are all the thyroid updates I he for now. I’ll keep you posted as I get more. I’m sorry to hear but I’m glad that your doctor is being so helpful. I was over medicated and become hypo the year I was diagnosed. I know it’s not fun to add a new list of symptoms to deal with when you’re already dealing with enough. I hope you’re feeling better soon and get into the good endo. Rooting for you!